Tein MonoFlex @ 949Racing - Miata Turbo Forum - Boost cars, acquire cats. 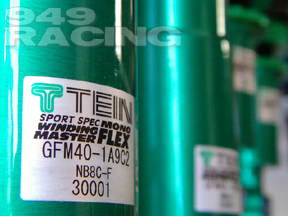 Now taking orders for JDM spec Tein Mono Flex, 90-05 Miata. I'll be shipping these with standard rates of 10/7kg (560/392#). Custom rates optional, $80 per pair. First shipment arrives mid March to early April. Expedited service of $240 gets your kit here in about two weeks. emilio, in your estimation, do the mono with the MSV ride smoother or rougher than the equivalently sprung standard flex? No direct experience myself, just conjecture. Ridden and driven Mono's in non-Miatas and they felt very good but that doesn't really offer any insight for our application. Based on my conversations with the engineer the Mono will have even less hysteresis at higher piston speeds than the Flex, and the Flex is already damn good in that respect. His opinion is that the comparison of performance with tiny piston displacements between a twin tube Flex and a Mono with MSV would give the nod to the Mono, because of the MSV. Now that is not specifically comfort but overall damper performance, which usually relates to comfort as well. The way I see it, those tiny displacements are the weak point of any monotube when compared to a twin tube. I think the marketing emphasis on the DFV, MSV and similar technologies when marketing monotubes is sort of a byproduct of the engineers trying to get them to match the small displacement performance of the best twin tubes. Having done that we get the best of both worlds. Damping rates wise, the Mono's are a bit firmer. I'll have some rough dyno comparsions tomorrow once I get the scales matched and all photoshopped together. First set in, got here in 7 days with EMS. Looks just like the Flex except the Mon Flex are anodized instead of powdercoated. Same measurements as Flex. 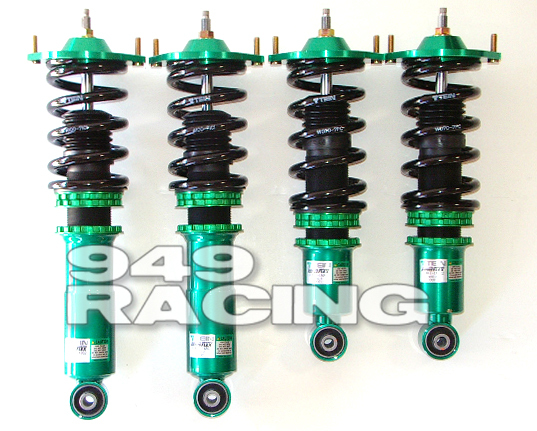 The set shown has the standard 949Racing Mono Flex 10/7 springs. The USDM Mono Flex for the 90-05 Miata is finally here. I should have the first shipment here by March 12. I had lobbied Tein to valve them firmer than the JDM Mono Flex I brought in last year and fit higher rate springs and they listened. The current spec is 10/8kg (560/448 in-lbs). I had the opportunity to test drive the USDM valve spec last year and can say they are at least as good a ride quality as the USDM Flex with even greater performance potential. It's possible to run hefty 12kg (680 in/lbs) springs up front without revalve on the Mono Flex. I want.....along with a set of 6ULs. M1 Tein Flex, Koyo 37mm, Konig Rewind etc.